In the late 60’s Volkswagen was putting the finishing touches on the follow up to the Type 3 or Fastback, Squareback and Notchback series. The Type 4 had a flat four similar to that of the previous generation but it was a bit larger at 1.7 liters and featured Bosch D-Jetronic fuel injection. At the same time Heinz Nordhoff, who was at the helm of VW, wanted a replacement for the Karmann Ghia and Ferdinand Piëch at Porsche wanted a less expensive replacement for the 912. The result was the 914 which would be sold jointly by the two companies. The Porsche version would carry a 2.0 liter flat six and the VW version would use the 1.7 liter four from the Type 4. Unfortunately Nordhoff passed away in 1968 before the first 914 hit the road. Kurt Lotz was his replacement at Volkswagen but without a personal relationship with the Porsche family the deal soon fell apart. Lotz drove VW to front engined, water-cooled cars and the VW 914 was doomed. 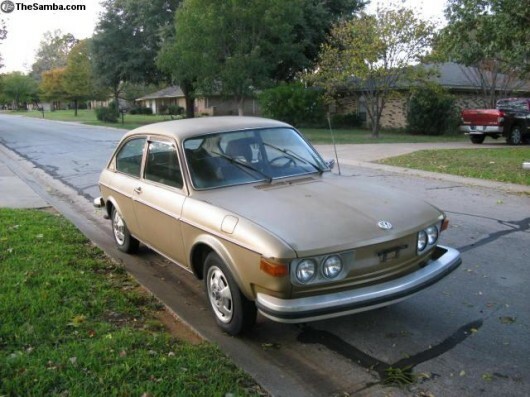 This Type IV 412 was the last year of the breed and is on The Samba in Lewisville, Texas for a very reasonable $2500. It shows some wear and the seller claims that a faulty fuel pump is keeping it from running. All else looks very honest with this car and it may even still wear its original gold paint job. The plethora of 914 engine parts available mean that you could really make this a sleeper.